David Goggins’ early life was marked by hardship, struggle, and poverty. But thanks to his astonishing work ethic and willpower, he achieved great success as a Navy SEAL, endurance athlete, and motivational speaker. 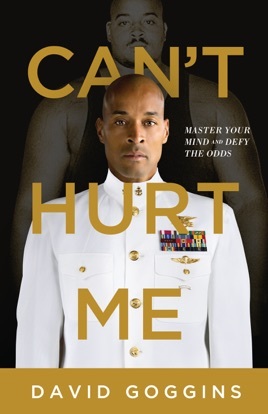 The personal, raw tone of Can’t Hurt Me sets it apart from most self-help guides. Rather than presenting his self-discipline techniques with a cheerleader’s perkiness, Goggins delivers his message with a veteran’s seen-it-all intensity. Our takeaway? The best way to get through a miserable experience—whether it’s running an ultramarathon or clearing out your inbox—is to put your head down and marshal your inner stores of focus and strength. Do not read this unless you plan to change your outlook on life and realize that failure and success are one and the same. First review I’ve ever given and never listened to an audiobook so quickly. Became a fan from his interviews on Joe Rogan and I’m glad I bought in. Kind of wish he was the narrator, but either way; the stories are insane. It’s hard to listen to them and not want to better yourself. No fluff, no empty plateaus. This guy has to be one of the baddest people of all time. I admit that I've read a lot of books on high-achievers, mostly written by special operators, psychologists, historians, etc. I have been following David Goggins for a couple of years, and I THOUGHT I understood his story in detail --- until I read his book. His ability to convey his story, analysis and message of the mindset of being driven has surpassed my expectations by far. Some may write him off as narrow-viewed with no filter or brake. This is far from the case. David Goggins has just as cerebral insight as Dr. Carol Dweck, Malcolm Gladwell and other great writers. The difference lies in his EXPERIENCE of the mindset and not simply an academic view. I would recommend this book to anyone who believes that the human mind and capability is far misunderstood, under appreciated and without having tapped its potential.